Pianist Jake comes from San Rafael, California, and began his piano studies there at age four. Currently based in New York City, he has performed in many venues throughout the United States with recent engagements bringing him to the San Francisco Steinway Piano Gallery, the Kalamazoo Epic Center, and the Avram Theater in Southampton, NY. 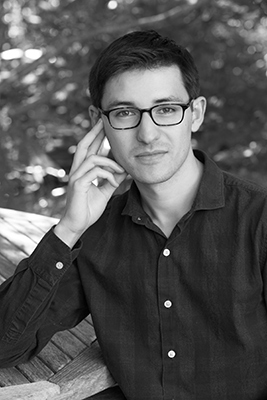 Jake has garnered several awards recognizing his work, including the NYU Walter Reinhold Scholarship, the Gilmore Master Class Fellowship, and the Oberlin Piano Faculty Prize in Accompanying. A passionate and experienced teacher, Jake teaches for Rubato Music School, Music to Your Home, and is on the adjunct piano faculty at NYU. Currently, Jake is pursuing a master’s degree in piano performance at NYU Steinhardt, where he studies with Eteri Andjaparidze. He did his undergraduate studies at Oberlin College & Conservatory, completing a B.M. in Piano Performance and a B.A. in Environmental Studies. Past piano teachers have included Peter Takács, John McCarthy, Dan Wall, Peter Horvath, and Adam Domash. Jake has also participated in master classes given by such distinguished pianists as András Schiff, Jura Margulis, John O’Conor, and José Ramón Méndez. In addition to his experience as a classical pianist, Jake also plays jazz, having performed both as a solo jazz pianist and as a member of many jazz combos. While not playing the piano, Jake enjoys cooking, and also devotes time to activism for various human rights causes. I believe that students learn best when they can engage as many of their senses as possible. As a teacher, I aim to integrate the student’s sense of musical hearing with their sense of touch and technique at the instrument. Furthermore, I strive to engage the student’s imagination in a variety of ways, through diverse images and metaphors. I believe in encouraging a free imagination, as it allows for the music to come alive and take on a deeper meaning for the student. I enjoy the process of discovering the many different pathways to engaging students’ musicality. I am intrigued by the variety of unique minds that exist among us, and I love the process of finding out the best approaches to each student’s learning style. This exploration of learning styles not only deepens the relationship between student and teacher, but also leads to discoveries about how the teacher can help unlock a student’s musical potential. I find this process incredibly exciting and rewarding.